Seated, left to right: Harriett Matilda (nee Burden), Jane (nee Willis), Ellen Mary, Sarah Jane with Elizabeth (8), Emily (6) and Frederick (4) Burgum. Fontley House which stands near the site of the old Fontley Iron Mill. 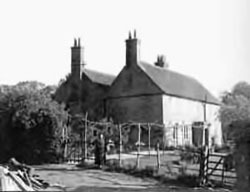 Great Funtley Farm where James Bartholomew and his father were born. Photos taken about 1950. Caroline (Cara) E.F. Shill wrote letters telling her cousin, Alfred Bartholomew, about his English ancestry. Alfred, the youngest surviving son of William Henry and Harriet Matilda Bartholomew had come to Canada as a home-child in 1901 after spending a few years in Portsea Island Union, an orphanage. "Grandfather quarreled with his father - I do not know why - and he left the iron mill and started a Smithy in Fareham. I believe it is still there. He got terribly into debt and was put in a Debtors Prison as they did in those days - Grandma (Jane Willis B.) paid the debts and he was released - it was not considered any disgrace." "They went to live in London where he got a post in the Albert Docks. Both Mother (Ellen Mary) and Aunt Carrie were born in London (recorded at Portsea). Whether Aunt Harriet the eldest sister and mother of Emily Burgum were too, and Ida's Father (William), I don't know. There were a number of other children who died as babies." "I don't know how long they lived in London, but he returned to Portsmouth and got a job in the Dockyard - I understand he had a good position there. He bought a good bit of land in Fratton, then a country district and built a house called Woodbine Cottage. It had a large garden and he grew and sold vegetables after he retired on a good pension. 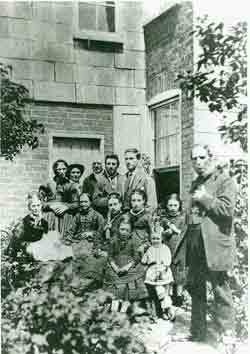 After Grandmother died (1881) Uncle Willie and Aunt Matilda and all their family went there to live. After Uncle Willie and his wife died (1892/93), Grandpa sold Woodbine Cottage and bought a house in Swanwick - the strawberry neighbourhood, and retired there. It was there he died and I think he was buried there." "He left everything he could to your sister Lily and didn't bother about the rest. He never forgave our mother (Ellen Mary Bartholomew Shill) for marrying against his wishes and did not even mention her in his Will. Grandfather Bartholomew had some brothers and sisters but know nothing about them - they don't seem to be a united family." Born: 1821 in: Fontley, Hampshire, Eng. Married: August 17, 1843 in: Fareham, Hampshire, Eng. Died: Unknown in: Swanwick, Hampshire, Eng. Born: January 18, 1822 in: Fareham, Hampshire, Eng. Died: 1881 in: Woodbine Cottage, Fratton, Hampshire, Eng. Born: January 16, 1845 in: West Ham, London, Eng. Married: December 03, 1866 in: West Ham, London, Eng. Died: August 06, 1876 in: Marylebone, London, Eng. Born: March, 1852 in: Portsea Island, Hampshire, Eng. Married: Abt. June 1873 in: Portsea, Hampshire, Eng. Died: January 23, 1894 in: Fareham, Hampshire, Eng. Born: October 08, 1854 in: St. Mary’s Portsea, Hampshire, Eng. Died: 1936 in: Fareham, Hampshire, Eng. Born: February 18, 1857 in: Fratton, Hampshire, Eng. 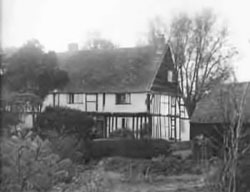 Married: May 25, 1878 in: St. James Church, Milton, Portsea, Hants, Eng.